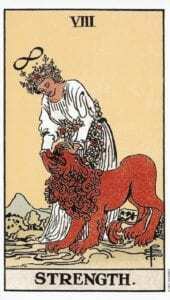 Every single card in a Tarot deck is associated with a particular number. From the Lovers to Strength to the World Card, they all have a numerological equivalent. Most of the time, especially in the major arcana, these numbers are actually written on the cards themselves. The Strength card may be seen as the counterpart to the Chariot: compared to its dynamic and forward-propelling motion, the kind of strength we see in this card is a very subtle inner strength. This comes less from force and more from understanding ourselves and being able to tame our wilder, primal instinct. If Strength is your birth card, it is likely you are a very even-natured person or someone who is introverted and at peace in their own company. 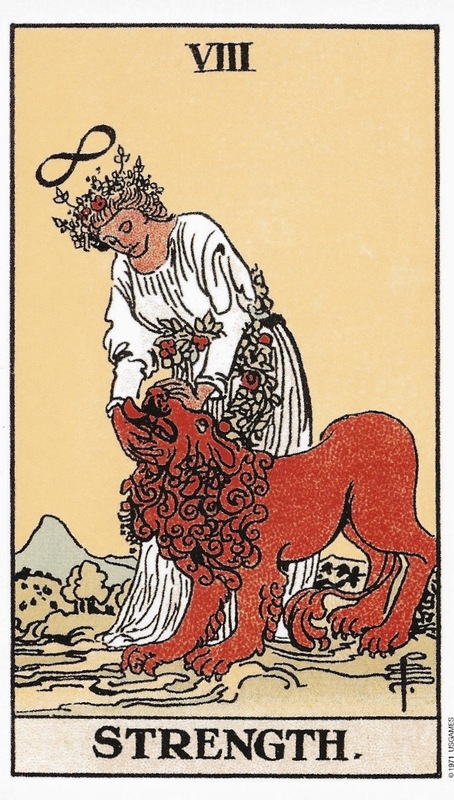 The strength card depicts a woman gently cradling the head of a lion in her hands. It’s clear her strength is not overpowering the lion, she is taming it with love, and a deep connection and understanding. People with this Tarot birth card possess this quiet strength, they are compassionate and loving and care deeply about making the world a kinder, better place. They are often the peacemaker, reaching out in the chaos of this crazy world, helping people to reconcile their differences and be kinder to one another. The woman on the card has the lemniscate (infinity symbol) above her head – just like the Magician – which connects her to the unending flow of life. Her white robe lends her an innocent air, and the crown she wears on her head represents her mastery and skill in this lifetime. Although people with this Tarot birth card tend to be quieter than other birth cards, they have a powerful influence over the people they meet. Others are drawn to their calm wisdom and seek solace in their soothing company. These people are often able to respond to life’s challenges with love and generosity. ⇢ You are loving and compassionate. ⇢ You understand yourself well, and know how to live a life that is true to yourself. ⇢ You are an emotion-led person who ‘feels the world’, but you are not a slave to your feelings. ⇢ You’re great at facilitating happy relationships, helping others to overcome their differences and get along. ⇢ You are loyal – a reliable friend. ⇢ When life hands you a challenge, you respond with love and forgiveness. These are similar to the traits which are emphasised in a Tarot reading when the Strength Card shows up reversed. ⇢ There may be times that you feel that you are treated as a doormat! ⇢ Though you’re proud of your ability to keep your emotions in check, it can be hard for you to let loose and express yourself wildly. ⇢ Strength people are the few out there who can work well with all kinds of people – at home with quiet types who share their gentle nature as well as more outgoing people who contrast well with your balanced approach to life. ⇢ Your ability to respond generously and with love to the challenges people often throw at you means that you put in what’s needed in all your relationships. ⇢ You’re an amazing person to have as a lover or partner! ⇢ Group facilitation would suit you. You’d be wonderful managing community projects where you’d bring people together to share their skills, despite their differences. ⇢ You’d work well in holistic wellbeing fields. Yoga, massage, reiki and spiritual work require someone who is in touch with themselves and respects other people’s energy, which is very much your strength. ⇢ You’d also be great in schools, possibly as a teacher but even more so as a youth worker or counsellor. Your ability to understand the often-wild emotions of young people gains you trust, and your loving but firm hand in tackling them is a gift not many can bring to this challenging role. Have you learnt something about yourself today? Or do you have a friend, colleague or family member with Strength as their Tarot Birth Card, and have just received an insight into your relationship with them? Drop us a comment below and share your insights, we’d love to connect!